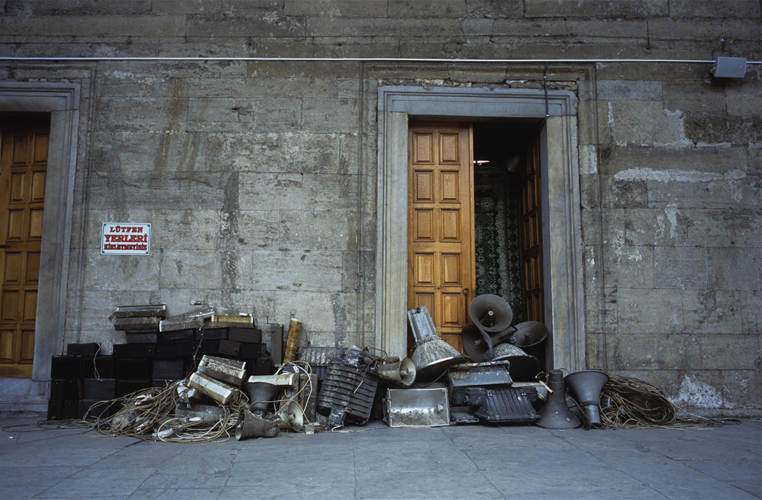 Dimitris Chalkiadakis presents his first solo exhibition at ABOUT: organized as part of the Athens Photo Festival 2011. The photographer presents works which document and explore the relationship between human presence and space, through a 12 year course. Dimitris Chalkiadakis is taking a step back, shooting photographs without the intention of commenting or criticizing. The subject of his photographs is approached with insight and underlines reality. It is often familiar or eerie, simplistic or evocative. He therefore allows the viewer to remain unaffected when decoding the documented structures in the photographs. All the photographs are printed from large format 10cm X 12,5cm and 35mm film. He was born in 1975 in the Cretan city of Rethymnon. He graduated from the Physics Department of the National and Kapodistrian University of Athens where he developed his thesis on “Digital Treatment of Stellar Images”. He has been scouting spaces for commercials, films, music clips and dance videos on a professional basis since 1999. From 2004 onwards, he got involved systematically with many more aspects of applied photography. He has worked as a film on-set photographer exploring the creative process in the film domain as well as in other art forms. His personal work is based on two main keystones: capturing the creative process as it evolves in time and recording the traces of human presence in space along the decay that inevitably occurs.